08 Apr 2019 --- The Quadram Institute Bioscience (QIB) has launched its first human clinical trial on the effects of phytic acid – found naturally in seeds, nuts and cereals – on gut bacteria. In this study, QIB researchers want to find out how phytic acid affects the microbiome, the population of trillions of microbes that inhabit the gut. A component of phytic acid – phytin – may play a role in achieving a better microbial balance in the gut. “The aim of the study is to investigate whether the consumption of phytin leads to a positive microbial profile, i.e., whether phytin decreases the relative abundance of bacterial species which have the potential to display pathogenic phenotypes,” Bhavika Parmanand, Study Manager and Ph.D. student at QIB, tells NutritionInsight. The Effect of Phytin on the human gut Microbiome (EPoM) study is funded by the Biotechnology and Biological Sciences Research Council (BBSRC). The study will take place in a new Clinical Research Facility (CRF), located at QIB and will involve all four founding partners of the institute. Roughly 300 researchers are setting up in CRF which is managed by the Norfolk and Norwich University Hospital and hosts research into a range of health conditions. The secondary aim of the study is to investigate whether a reduction in pathogenic bacteria leads to an increase in beneficial bacteria. “If we find that the consumption of phytin leads to the increase of beneficial bacteria, such as bifidobacteria and lactobacillus, then there is always the potential of using this plant compound to help improve the profile of guts that are in a dysbiotic state,” Parmanand adds. Phytic acid in the intestine can bind to iron. Iron is an important nutrient for health and is absorbed in the small intestine. 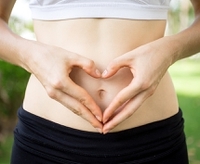 Unabsorbed iron passes through to the large intestine, where the majority of gut microbes live. A type of potentially harmful bacteria that can colonize the large intestine relies on this iron, however, beneficial bacteria are able to survive without iron, according to the researchers. “Phytin acid is found in plants and is the main phosphorus storage compound within plant-based foods. Phytin is a salt form of phytic acid, the main form present. It has been illustrated to chelate iron strongly in colonic conditions and this, therefore, means that it reduces the availability of iron to potentially pathogenic bacteria,” Parmanand says. 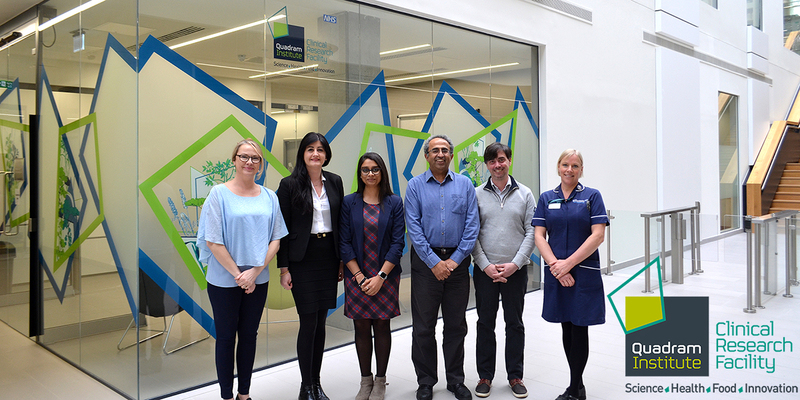 Click to EnlargeThe team behind the EPoM study: L-R NHS Principal Investigator Dr Melanie Pascale, QIB Human Studies Coordinator Dr Antonietta Melchini, Bhavika Parmanand, Professor Arjan Narbad, Dr Lee Kellingray, Senior Research Nurse Louise JonesThe research team wants to see whether delivering a form of phytic acid to the large intestine binds excess iron and so decreases the proportion of “bad” bacteria in the microbiome. “Pathogenic bacteria require iron for growth and development, while beneficial bacteria do not. Therefore, if we use phytin as an iron chelator, we create an opportunity to reduce the growth of pathogenic bacteria and allow the beneficial species to grow,” she notes. Parmanand is working with Professor Arjan Narbad and advised by Professor Susan Fairweather-Tait from the University of East Anglia (UEA). Additionally, the study is aided with expertise from QIB researchers, Dr. Lee Kellingray and Dr. Jennifer Ahn-Jarvis and the clinical team at the CRF, led by NHS Principal Investigator Dr. Melanie Pascale. The Quadram Institute is a partnership between NNUH, UEA, BBSRC and QIB. “The EPoM study marks an important milestone for QIB, as it is the first trial involving the CRF. I envisage this will be the first of many joint research studies where QIB, UEA and NNUH CRF staff work together to make a strong impact in health and social care research,” says Dr. Antonietta Melchini, QIB Human Studies Coordinator. “The EPoM study will allow researchers to get evidence on the effects of phytic acid that is only possible from working with human participants,” Dr. Melanie Pascale notes. According to the institute, QIB seeks to bring about a new era for food and health research, working at the interface between food science, gut biology and health. Last month it was announced that QIB secured funding from The European Institute of Innovation & Technology (EIT) Food that will be used to support food and nutrition start-ups. The investment is part of the €46.4 million funding the EIT has received from Horizon 2020 (the EU’s research and innovation framework program and partner contributions) to support its mission to transform the agrifood system by investing in innovative projects. The start-ups to benefit from the financial support are Quisper, a personalized nutrition services platform, and Seafeed, a developer of fermented seaweed-based novel feed additives.